The property listed as Lot #4, Boalsburg, originally belonged to George and Elizabeth Boal, who sold the property in 1857 to Peter S. Fisher. According to the 1874 Pomeroy’s Atlas, lot #4 was the only lot located along Main Street (then called Pitt Street), without a building. In 1889 after 15 years, Dr. Fisher sold it to Peter and Mary Weber. They sold the property in 1899 to Mr. and Mrs. John and Arabella Kimport, who in 1909 sold the property to Mr. Elmer Houtz, a farmer. Mr. Houtz and his wife, Floy sold the lot to Mr. and Mrs. John and Helen Ishler in 1921. Ishler was a butcher and built the house, butcher shop, and slaughterhouse on the lot between 1924-25. 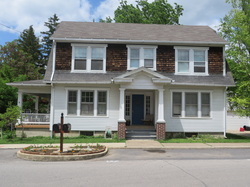 The Ishlers owned the property until 1932 when it was sold at a sheriff’s auction and ended up owned by Dr. Peter Swank who divided it into up and downstairs apartments and most likely used the first floor for his practice and lived upstairs. The house at 203 E. Main Street adds a touch of modernity within the surrounding landscape of nineteenth century Boalsburg. The two-story house is on Lot #4, just a block away from the Diamond. The facade faces south, looking onto East Main Street and the west side is adjacent to North Academy Street. The house was split into first and second floor apartments between 1937 and 1940 but this does not detract from its exterior integrity. The house is a loose revival of the later (post 1750) Dutch Colonial style. It is capped by a gambrel roof that splices through a full width shed dormer on the front side of the house. The roof is split shingled asphalt, resulting in a checkerboard pattern of light and dark tones. A brick chimney juts out from the roof at the rear of the dwelling. The structure's first story consists of white horizontal aluminum siding. Dark, wooden shingles continue from the dormer overhang to complete the second story. A full‑width, one story porch occupies the west side of the house providing the entrance to the first floor apartment. Four white, squared, wooden, Doric columns support the porch that rests on a slightly raised, concrete foundation. The columns are interlaced with railings and balusters that are attached directly to the house. The facade of the dwelling is a symmetrical three over three construction, three bays wide and two bays deep. The front door is recessed from the rest of the facade and a one‑story entrance porch capped with a pediment, provides the main entrance for the upstairs apartment. Square white, Doric columns support the pediment, which is covered with white aluminum siding. The entrance porch rests on a foundation of brick. The brickwork that supports the columns is done in a Flemish bond fashion of alternating headers and stretchers on the same row, while the side, of the entrance porch is done in the typical English bond fashion of alternating rows of headers and stretchers. The brickwork has been recently redone. Three steps lead up to the full‑paneled, bright blue door, which is flanked by nearly full‑length sidelights. These consist of 5 rows of two light panes and two rows of solid wood twin panels complete the bottom of the sidelights on each side. The windows are all double hung and without shutters. The upper portions of the windows are divided with either six‑over‑six panes or four‑over‑four panes; the bottom half are all single paned. The windows are thus described stylistically as either six‑over‑one or four‑over one. The front two first story windows are identical triple strips of double‑hung sash windows. The middle strip window on either side is a six‑over‑one paned window, while the two strips hugging each side are narrower, having only a four‑over‑one pane pattern. The three windows occupying the front upper story of the house are identical double strips (separated by a mullion) of double‑hung sash windows with a six‑over‑one pane pattern. The upper story windows are all the same width. A fairly large addition that extends about seven feet out from the original rear foundation of the house was added sometime during the late twentieth century. This houses the master bedroom of the first floor apartment. A small, unenclosed back porch, extending from the rear, east side completes the back of the dwelling.